Blog Quick Quotes: Cards Inspiration with Connie! 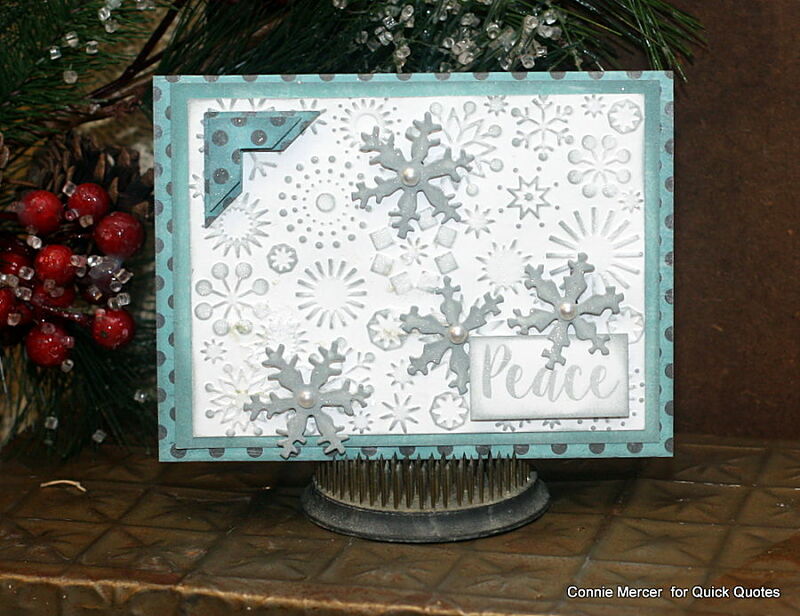 Hi, Connie here with a Holiday card using the Whistlin' Dixie Collection and Quick Quotes PowderPuff Chalk Ink. I love how the Quick Quotes PowderPuff Chalk Inks flow so smooth over an embossed card front. Let me show you. The white cardstock is embossed with a embossing folder and then highlighted with Quick Quotes PowderPuff Chalk Ink. Love the look and so easy with awesome results!!! The snowflakes are punched from a die and then inked with the Feather Gray by Quick Quotes. Oooooo this is so pretty! Who won the challenge #57 for the things that fly? I can't find it anywhere. Thank you. Hi Bunny, the winner will be posted on Friday. : ) Thanks so much for stopping on over to the blog!